Weighing in at a whopping 700g (seriously, this thing is huge), the Giant Rose Bombshell fizzes away to reveal a heart of yellow rose petals. The formulation is scented with rose absolute, Sicilian lemon oil, and rose oil. It gives the bath a brilliant shade of pink and thanks to the mineral-rich fine sea salt, the skin is left feeling soft and supple. $20 is certainly a lot to spend on one bath but for a special occasion, it's definitely worth the splurge. 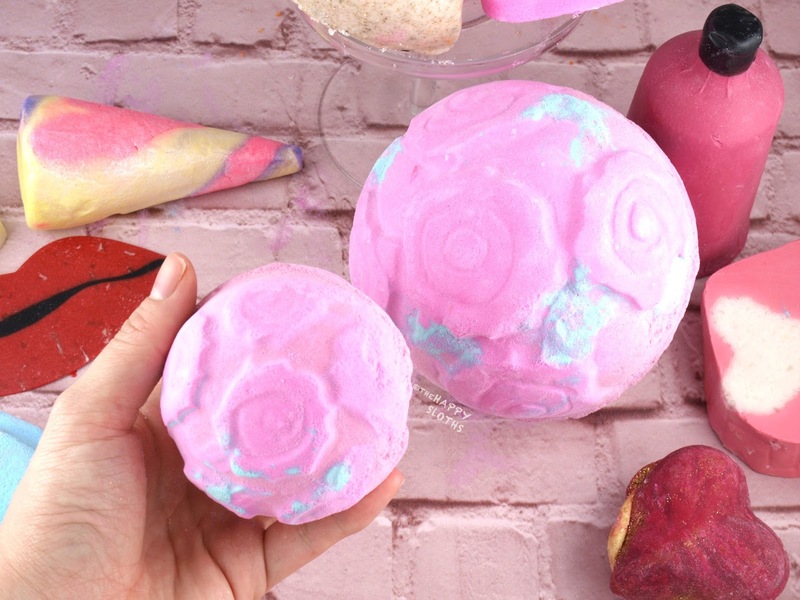 A regular-sized version of Rose Bombshell, this bath bomb is the perfect alternative for those that want a romantic Valentine's bath without having to break the bank. Shaped like a white heart running through a tunnel of pink, this is a creamy solid soap bar made with glycerin, rose water, cocoa butter, and coconut oil. The formulation provides a rich lather and the scent is super sweet and citrus-y thanks to the sweet wild orange oil. Molded to look exactly like a mini yacht, Love Boat fizzes away to reveal pretty streaks of blue, pink, and yellow. Thanks to the Scillian lemon oil, sweet orange oil, and rose oil, the bomb has a subtle citrus fragrance. Lastly, there is a pinch of heart-shaped sprinkles hidden on the bottom of the boat, which provides just a little extra dash of romance to your bath. Made with shea and murumuru butter, this is a solid shower cream scented with the same notes (jasmine, ylang-ylang, and vanilla) as the Tender is the Night Massage Bar. The formulation lathers well and leaves the skin hydrated and softened. However, I find the scent to be quite weak. Even when I sniff the product up close, I only get a very subtle hint of florals. Update: After using this shower cream five or so times, I've noticed that the scent has gotten stronger. It may be that the outer layer lost its smell since production but the inner parts are still perfectly scented. Embedded with bits of rose petals, this is a rich massage bar made with organic cocoa butter, shea butter, and safflower oil. The formulation is scented with cypress, violet, and orange flower but the smell is pretty subtle. The bar is not super melty which I like because it's not messy to use. 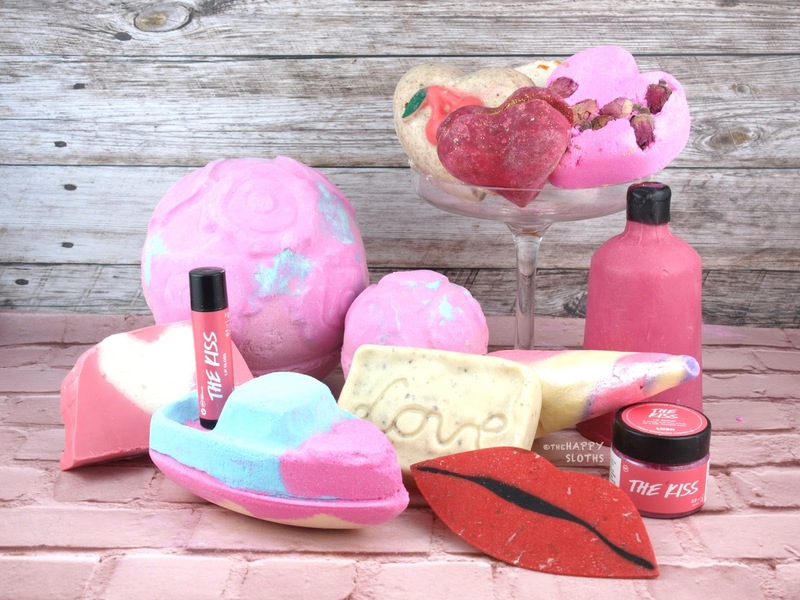 A Valentine's Day classic from Lush, Unicorn Horn is a colorful pastel bubble bar scented with an alluring and sweet combination or lavender, ylang-ylang, and neroli. Simply crumble under running hot water to achieve the perfect bubble bath. 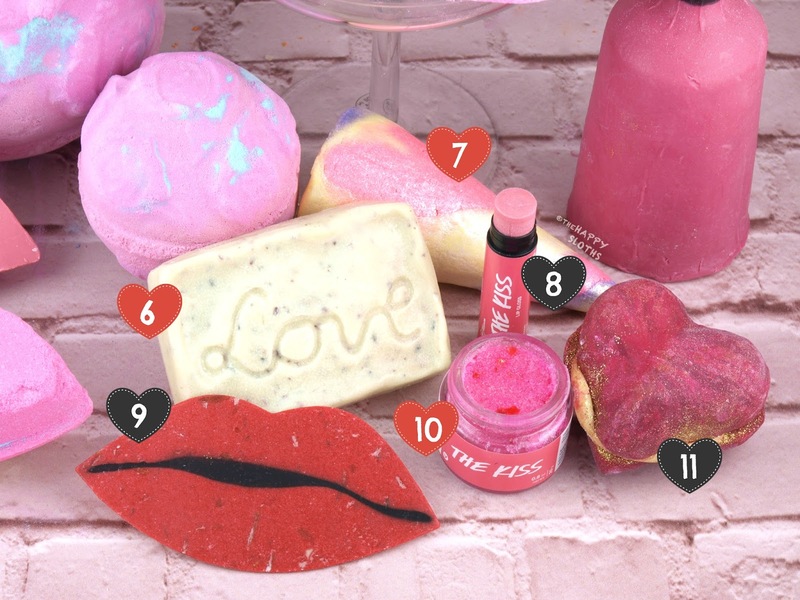 Another Valentine's veteran, The Kiss is a sheer pink balm packed with loads of shimmers. It is formulated with organic jojoba oil, shea butter, and Kalahari melon oil. Additionally, the balm provides a natural sheen while leaving behind a subtle sweet fragrance. Shaped like a pair of luscious red lips, this is a thin sheet of soap paper made with fresh apple pulp. The formulation lathers extremely well and the soap has a warm and spicy apple, clove, and tonka scent. You can get at least two to three washes out of one sheet, making it great for traveling. Topped with a dash of heart-shaped sprinkles, this is an exfoliating lip scrub made with sugar, fine sea salt, cocoa butter, mandarin oil, and almond oil. The scrub is tinted a bright bubblegum pink and it has a sweet citrus scent. It works perfectly at removing any dry patches and dead skin on the lips while leaving behind a lightweight, moisturizing veil. 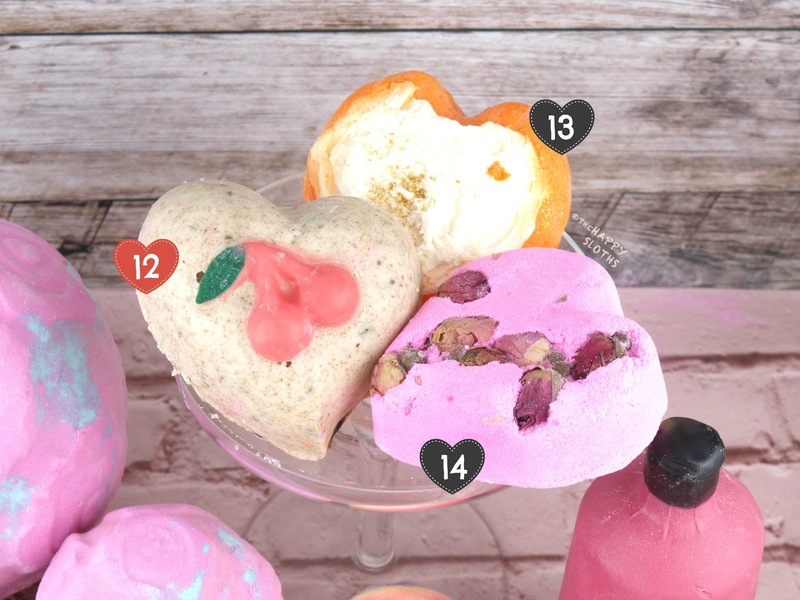 Scented with rose, jasmine, lemongrass, and bergamot, this is a gorgeous bubble bar made with a creamy butter-filled center. It turns the bath water red and shimmery while leaving the skin softened and conditioned. Made with fine sea salt, fair trade organic cocoa butter, and murumuru butter, this is a creamy in-shower scrub bar. Thanks to the cocoa absolute, vegan white chocolate, and ground cherry stones, the bar smells exactly like a piece of cherry chocolate treat. The formulation is super scrubby and nourishing but it melts quite quickly so you can get at most three full body scrubs out of the entire bar. Nevertheless, this is a total gem! 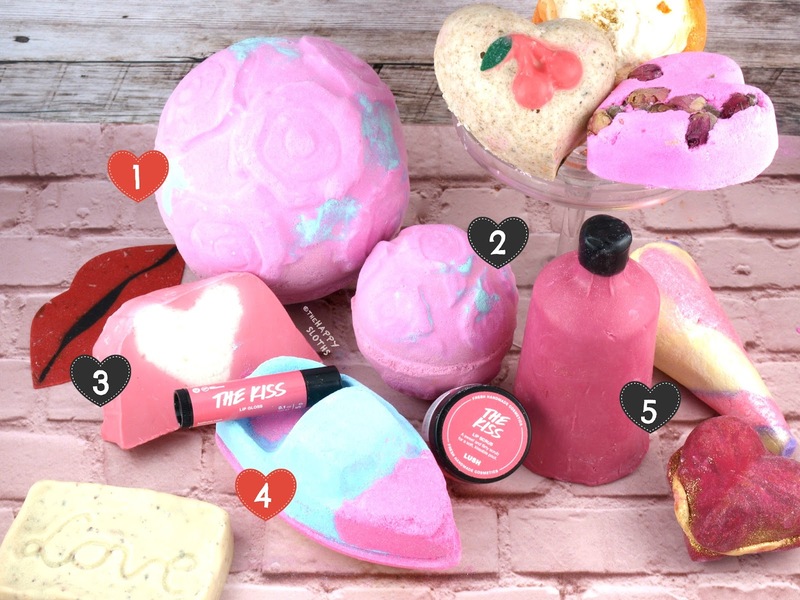 If you are a fan of Lush scrub bars (ex. 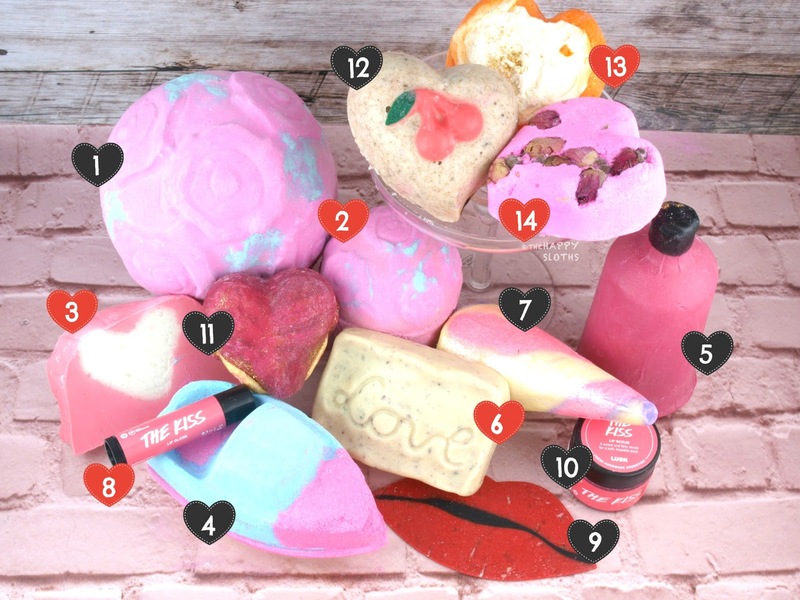 Scrubee), definitely check this out! With a citrus floral scent thanks to oils of bergamot, geranium, jasmine, rose, and ylang-ylang, this is a bubbly bath bar topped with a frosting of cocoa butter. The design makes it look like an edible piece of pastry! Embedded with seven rosebuds, this is a pink bath bomb scented with jasmine, rose, geranium, and lemon. The design is super classic and the price is relatively affordable so if you are looking for just a little treat for Valentine's Day, then pick this one up. How will you treat yourself this Valentine's Day? Are you planning on picking up any of these limited edition releases? Share with me in the comments below!